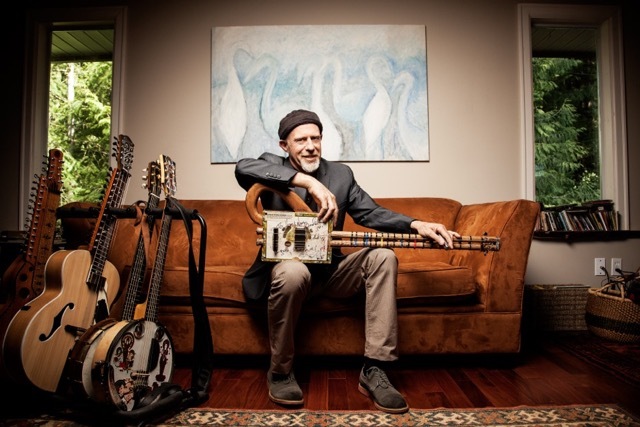 Harry Manx has spent decades fusing eastern musical traditions with the blues, switching fluidly between conventional acoustic and electric guitars, banjo and the Mohan Veena, created by Harry’s Indian mentor Vishwa Mohan Bhatt. His original music blends East and West ‘creating musical short stories that wed the Blues with the depth of classical Indian ragas’. A worldwide festival favorite, Harry’s 13 albums and ceaseless touring have seen him earn a slew of Maple Leaf, Juno and Canadian Folk Awards, nominations, and accolades from musicians and fans alike. On a wintry Chicago morning in February 2013, Harry’s 20-stringed Mohan Veena, was stolen from an airport carousel. Announced on his Facebook page, by the next day over 3 million people had spread the word, searching, building him a new one, and (a praying for its return. The story from the Chicago Tribune was picked up by AP news service and soon the whole world was learning about this exotic instrument, and the completely unique music of Harry Manx. Police found the culprit and the instrument 2 days later, and Harry was reunited with his signature instrument. February 2014, saw the release of Harry’s 12th studio recording – ‘Ohm Suite Ohm’, distributed by Vitamin Records. This album reveals Harry’s new ‘Bollywood electric slide guitar’ work, and steers Harry in a somewhat new direction. Featuring instrumental compositions, original songs, an exceptional cover of John Coltrane’s ‘A Love Supreme’, guest vocalists and international collaborators, it’s all in the service of a completely unique cross genre that’s hard to pigeonhole, but easy to love. And now the prolific Harry Manx has just released his newest album – the highly acclaimed ‘20 strings and the truth’. A mostly intrumental album that is a homage to his beloved Mohan Veena.